August 2014 – OK, Fine. According to ABC News, Germany will send high-end rifles, tank-busting weapons and armored vehicles to aid Kurdish fighters battling Islamic extremists in Iraq, officials said Sunday. Germany’s defense minister said the arms would be sent in three shipments, starting next month, and would initially be enough to equip a brigade of 4,000 Peshmerga fighters. Deutsche Welle states that Germany has shipped more than 100 tons of aid deliveries to help refugees in the country. In addition to humanitarian aid, Germany is also going to send military equipment to help support Kurdish fighters. The first package has already been put together. It contains defensive equipment such as helmets, body armor and walkie-talkies but not weapons. There are six soldiers based at the German consulate general in Erbil that have been tasked with delivering military equipment. If needed, they will also coordinate instructions on site, according to the website of the German armed forces. There are some critics in Merkel’s government coalition. Opposition Left party is critical of arms transfers to crisis areas; the Green opposition party has not yet expressed a party view on the issue. The German government has announced that they will let parliamentarians vote Monday on sending weapons to Kurds in Iraq, even though the government doesn’t have to follow this procedure from a formal point of view. It’s widely expected to achieve a majority in parliament. However, according to a recent poll, two thirds of Germans are against weapons deliveries. Since the beginning of June, the United States has helped peshmerga fighters and the Iraqi army by carrying out air strikes and supplying military equipment. Other countries have said they intend to send weapons and ammunition as well, including Albania, France, the UK, Canada and Croatia. Denmark wants to provide a cargo plane. Iran delivered weapons last Tuesday. Update: German intelligence estimates at least 400 Germans have joined the ISIS. Shannon Watts founded the group Moms Demand Action for Gun Sense in America which is part of the larger organization Everytown for Gun Safety. The Huffington Post states that Moms Demand Action has become a nonprofit organization with tens of thousands of members and more than 80 local chapters across the country. She is a 43-year-old mother of five children and has been a stay-at-home mom in Indianapolis since 2008. Prior to that, she had a 15-year career as a communications executive for both public relations agencies and Fortune 500 corporations. The day after the Sandy Hook Elementary mass shooting, Ms. Watts started a Facebook page mobilizing American moms to create an organization like Mothers Against Drunk Driving, but for gun reform. Much like Mothers Against Drunk Driving was created to change laws regarding drunk driving, Moms Demand Action for Gun Sense in America was created to build support for common-sense gun reforms. Since its inception after the Sandy Hook Elementary mass shooting, Moms Demand Action has established a chapter in every state of the country and is part of Everytown for Gun Safety along with Mayors Against Illegal Guns. Everytown for Gun Safety claims over two million members. Quadruple murderer Michael Eric Ballard told a Northampton County, Pennsylvania judge that he doesn’t need more tests to prove he’s sane. In court Friday, he said that he not only wanted to waive his appeals and accept his death sentence, but he also pushed for that execution to be carried out as quickly as possible. Northampton County Judge Emil Giordano said he wanted Ballard to be evaluated by a psychologist before he gave up on his appeals, but the killer surprised the judge by calling it pointless and an unnecessary delay. Judge Emil Giordano said he would like Ballard to have a mental health evaluation and return to court in roughly 45 days. Giordano told Ballard he worried the defendant was asking him to “short circuit the legal system,” but Ballard said he didn’t see it that way. Friday’s hearing was scheduled at the request of Northampton County District Attorney John Morganelli, who wanted Ballard to state his intentions on the record to a judge. “I think we’re going to find that he’s definitely competent,” said Morganelli. The last death row inmate executed in Pennsylvania was Gary Heidnik in 1999, in a similar situation. He also gave up the right to appeal. TYT: Will The NRA Support The Huey P. Newton Gun Club? There’s been very little talk from the NRA and gun owners about this gun club. TYT video. 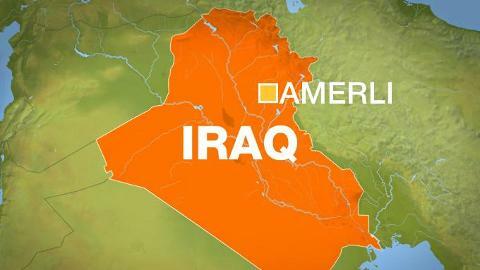 Saturday, the U.S. held air strikes around Amerli in support of Iraqi troops. The Pentagon said the strikes would be “limited in their scope and duration.” The strikes appeared to swiftly tilt the balance in favor of Iraqi government forces. Militia leaders aiding the offensive and Iraqi government officials had said that a coordinated assault to clear the Islamic State-controlled towns around Amerli began after nightfall in Iraq on Saturday. Amerli is a mostly Shi’ite town in Iraq about 100 miles north of Baghdad. I.S. militants have had the town of Amerli cut off from food, water, and medical supplies. The town is home to 18,000 Shi’ite Turkmen. Officials have begged British and American forces to intervene on their behalf before it is too late. Jihadists had surrounded the town in June, preventing food and other aid from reaching the population there. Residents had armed themselves to fend off the militants, who have made sweeping gains across the country in recent months, but critical supplies began to run low. The Iraqi military had delivered aid and evacuated some vulnerable residents from the town over the past two months. But the assistance had limited impact, residents said. Last week The U.N.’s representative in Iraq, Nickolay Mladenov, expressed alarm about the situation and warned of a possible massacre should the Islamist militants overrun the town. The U.S. strikes and coordinated humanitarian aid drop marked the second time this month that the United States has intervened militarily in Iraq to prevent a jihadist attack on thousands of trapped civilians. 250 soldiers were captured during the weekend when Islamic State Sunni militants seized an air base in the province of Raqqa, in northern Syria. Reuters claims a video of the execution was verified by an IS fighter. “Yes we have executed them all,” he said. US President Barack Obama said the US was working to get more countries on board in order to strike at IS. Mr Obama said it was time for Middle Eastern nations to “stop being ambivalent”. The latest video of IS brutality to have emerged shows the bodies of scores of men wearing nothing but their underwear lying face down. The soldiers were apparently militia forces loyal to President Bashar al Assad. Tabqa is the location of the Syrian airbase captured by IS in the last few days. The head of the UK-based Syrian Observatory for Human Rights later confirmed that Syrian soldiers had been “executed” at three different places, resulting in the deaths of at least 160. Meanwhile, the United Nations says an armed group has detained 43 UN peacekeepers from the Philippines and Fiji in Syria’s Golan Heights. A further 81 peacekeepers are also trapped, the UN has said.